Halfway around the world, stepping into the Blantyre Entrepreneurs Hub was reassuringly familiar. Even though the dusty streets and tin-roofed houses of Malawi, a tiny country in southern Africa, are very different from the condo towers and streetcars of Toronto, spaces of social innovation around the world seem to share more similarities than differences. Motivational quotes from famous innovators decorated the lime green walls. Bright orange chairs surrounded the black glossy work tables. The office was quiet on the cool evening in May when I visited. Most of the entrepreneurs – the photographers, caterers, and website developers – had already gone home to their families or guest houses for the evening. Dineo Mkwezalamba, Program Manager for Entrepreneurs Motivation Network (EMNET), greeted me with a warm smile. She was excited to show me around the cooperative’s facilities. The Hub, as it’s known, is a coworking space for entrepreneurs in Blantyre, which is the financial and business capital of Malawi, and a city of one million people. The space provides access to high-speed internet, meeting rooms, electricity, and security. These are big perks for the entrepreneurs, most of whom do not have access to the electrical grid at home. The collective buying power of the Hub makes the amenities affordable. In addition to the monthly memberships, they’ve begun to offering day-pass for about CAD$1.75. The hope is that once entrepreneurs visit the Hub for a day, they’ll become sustaining new members. On the tour, Dineo pointed out the ocpen-seating desks for Silver Members (like CSI’s HotDesk space), the café (with member discounts! ), and the closed offices that can accommodate up to four people in a single business. One of the offices stood empty and Dineo assured me that this was because the interior design company had recently “graduated” up to an office building of their own. In addition to providing space for entrepreneurs, EMNET also hosts a local Pitch Night (read an article from the BBC about their pitch night) and runs a youth entrepreneurs training program. I eagerly listened and took notes as she told me about how they frame the concept of entrepreneurship for the youth. I wanted to be able to remember the way she described their mentorship program, connecting local business leaders and high school youth, and the way she connects the concept of entrepreneurship with ideas that the youth already understand. “All youth know vendors,” Dineo explained to me, “because many of their parents and family members are vendors.” According to the latest labor statistics, 89% of people who are working in Malawi are in the informal employment. Informal employment covers farming and, especially for women, buying and reselling food and household items. When Dineo talks to youth about entrepreneurship, she wants them to think beyond selling eggs. “Youth know that vending is the first step to being an entrepreneur. Our goal is to help them get to business success, and to make sure entrepreneurship doesn’t seem like a scary thing.” Dineo and her team use the motto, “train to sustain,” when teaching the youth about adapting a mindset of starting a sustainable and scalable business. I am incorporating this process of helping people imagine themselves as entrepreneurs into my work with Spirit in Action International. Similar to my experience at CSI, perhaps the most important perk of the Entrepreneur’s Hub is the access to community and to those serendipitous moments of collaboration. I told Dineo about one of my favorite parts of CSI – Salad Club. Some of the best conversations and exchanges of ideas at CSI have been over a plate of salad. When I mentioned this, Dineo smiled with a twinkle of excitement in her eye. She’d been working on creating more buzz around the Hub office. In July, I got a text message from her, “Keep an eye on our Facebook page today! Your visit sparked some new activities!” That day, the Hub kicked off their #SocialFridays, showing a movie in the lounge space. Generating ideas for animation from their community, they’ve also established: Leadership Mondays, Startup Tuesdays, Business Wednesday, and She Leads Malawi Thursday. It’s so easy to focus on the differences between places like Blantyre and Toronto. In my experience, Malawians are just as likely as Canadians to think that there’s little we could have in common. Representations of North America arrive in Malawi through the distorted examples of volunteer programs, television shows, and music videos. These leads to a belief that Americans (and Canadians lumped in with them) are all rich people who don’t have any worries or challenges. Similarly, representations of Malawi (lumped in with all of Africa) mostly arrive in Canada through calls for charity and news about poverty. There are not many opportunities for each of us to see the wealth of experiences and cultural diversity in each country or to experiences each other as individuals. My conversation and exchange of ideas with Dineo felt different. It gave us a chance to connect as individuals and peers. I left feeling like we were on the same team. Around the globe, there’s always a need for spaces like CSI and the Hub. Places to build community, to bring people together, and to share costs so that entrepreneurs can get our ideas and products out in the world. Tanya Cothran is Executive Administrator at Spirit in Action International, a granting organization that supports community organizations and individuals in Kenya, Malawi, and Uganda. She is the co-editor of Smart Risks: How small grants are helping to solve some of the world’s biggest problems, published by Practical Action Publishers, in April 2017. Tanya has 10 years’ experience in philanthropy and international development and is a member of CSI Annex. We’re at it again! CSI is buying a new building in Downtown Toronto! 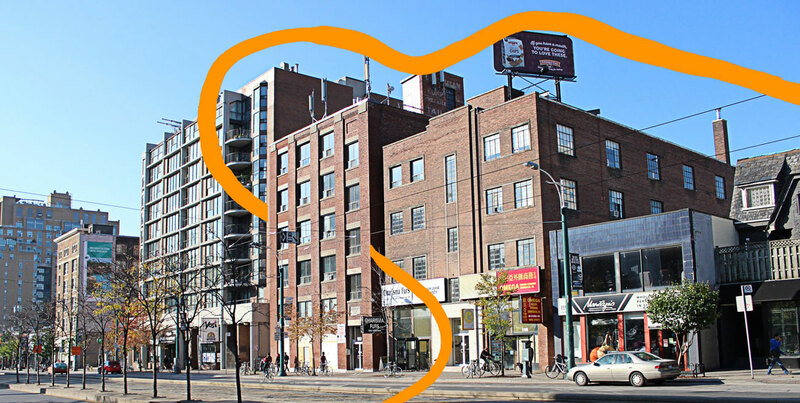 The Centre for Social Innovation has just ‘gone firm’ on the purchase of 192 Spadina! This spectacular 64,000 square foot brick and beam building was built in 1920 and is known as the Murray Building. Formerly a printing company, with a stint in the garment industry, the Murray Building currently houses about 60 new media, arts, urban and other small businesses.